High to intermediate levels of ethanol consumption increase the risk for liver cancer in patients with fatty liver disease, researchers report in the April issue of Clinical Gastroenterology and Hepatology. Nonalcoholic fatty liver disease is a common cause of chronic liver disease associated with obesity, dyslipidemia, pituitary dysfunction, hypertension, sleep apnea, and type 2 diabetes. Patients with nonalcoholic steatohepatitis are at higher risk of developing hepatocellular carcinoma (HCC). Nonalcoholic and alcoholic fatty liver diseases can be differentiated based on degree of patients’ alcohol consumption. However, it is not clear how ethanol consumption affects the risk of HCC in patients with either form of fatty liver disease. 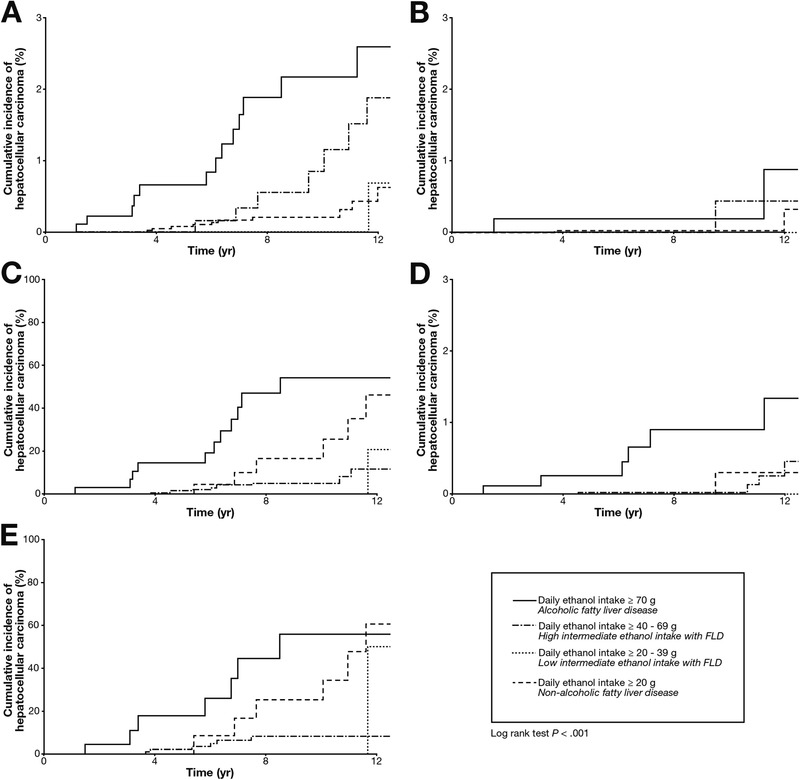 Yusuke Kawamura et al performed a retrospective study to determine the incidence and risk factors for HCC in 9959 patients in Japan with fatty liver disease, diagnosed by ultrasound and the FIB-4 index, with varying levels of ethanol consumption. Ethanol intake in relationship to the odds for HCC in patients with fatty liver disease. 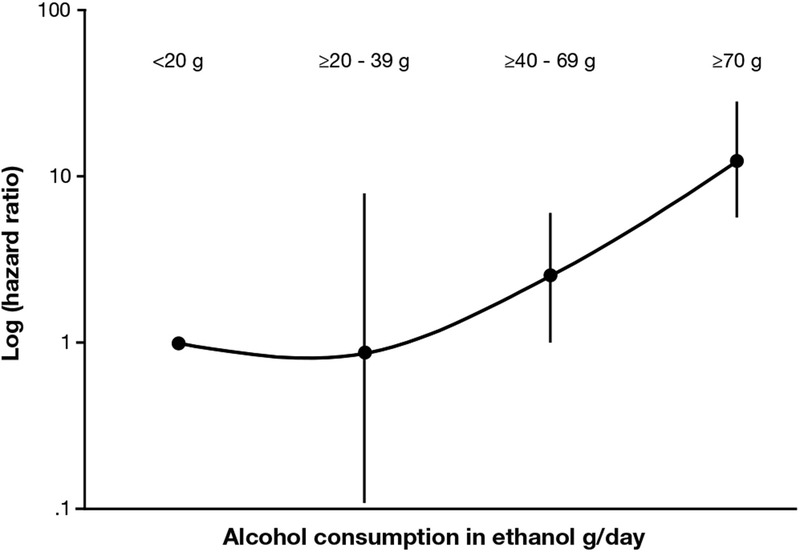 Patients were assigned to 4 categories based on reported level of ethanol consumption: <20 g/day (n = 6671), 20–39 g/day (n = 753), 40–69 g/day (n = 1589), and ≥70 g/day (n = 946). One standard drink contains 10 grams of alcohol—equivalent to one ordinary beer, a small glass of wine (100 mL), or 30 mL of spirits. Forty-nine patients developed HCC during the follow-up period (mean, 5.4 years). The annual incidence rate of HCC was 0.05% in patients with fatty liver disease and daily ethanol consumption <20 g/day. Increasing levels of ethanol consumption were associated with increased annual incidence rates of HCC: 0.06% for patients with 20–39 g/day ethanol consumption (hazard ratio, 1.54), 0.16% for patients with 40–69 g/day ethanol consumption (hazard ratio, 3.49), and 0.22% for patients with ≥70 g/day ethanol consumption (hazard ratio, 10.58), compared with patients with ethanol consumption <20 g/day. Multivariate analysis showed that ethanol consumption ≥40 g/day was an independent risk factor for HCC. Ethanol consumption strongly promoted hepatocarcinogenesis in patients with fatty liver disease who had abnormal liver function and advanced fibrosis, which the authors say was not surprising. However, ethanol intake also increased risk for HCC in patients with fatty liver disease yet normal liver function and nonadvanced fibrosis. High levels of high-density lipoprotein cholesterol and triglyceride were also risk factors for HCC. The authors propose that fatty liver disease therefore promotes hepatocarcinogenesis with or without excessive ethanol consumption, but that ethanol consumption has a synergic effect with features of fatty liver. A previous study reported a synergistic effect of obesity and alcohol consumption on hepatocarcinogenesis in patients who tested positive for the hepatitis B virus antigen. The authors point out that this was a retrospective study with a higher proportion of men than women (there were no women in the groups that consumed the greatest amounts of alcohol). Also, the study did not compare the incidence of HCC with that of the general Japanese population. However, based on their findings, Kawamura et al recommend careful monitoring and follow-up of elderly patients with fatty liver disease and high serum levels of aspartate aminotransferase and low albumin levels, thrombocytopenia, diabetes, and a history of high or even intermediate ethanol consumption (≥40 g/day). Kawamura et al also evaluated the usefulness for predicting hepatocarcinogenesis in patients with fatty liver disease with varying levels or absence of ethanol consumption.